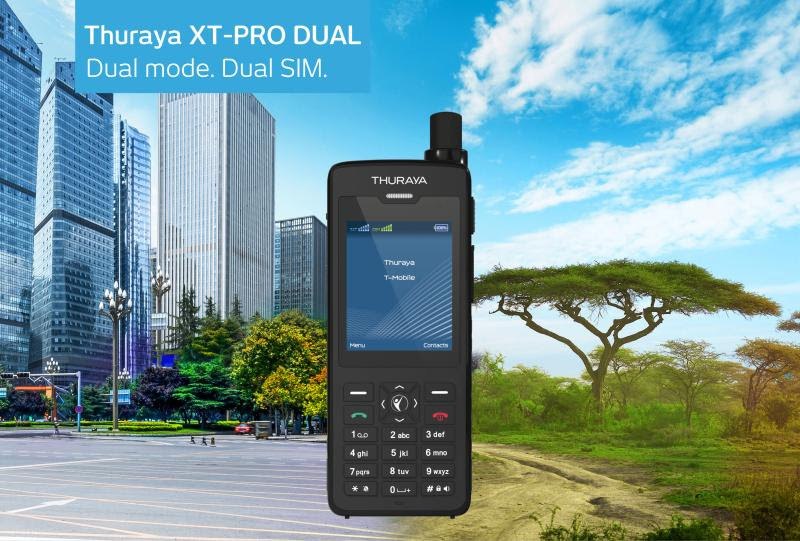 DUBAI, UAE: PRNewswire: Leading Mobile Satellite Services (MSS) operator Thuraya Telecommunications today made further advances in satellite phone capability with the launch of the world’s first dual mode, dual SIM phone. The Thuraya XT-PRO DUAL bridges the gap between satellite and terrestrial communications, allowing users to move seamlessly in and out of terrestrial coverage to enjoy connectivity in any location. With a dedicated SIM slot for satellite communications and a second one for GSM communications, Thuraya’s latest groundbreaking handset transforms usability and choice. Users can opt for a Thuraya SIM card and their GSM card, or select any combination of SIM cards that meets their requirements. Versatility has been taken to unprecedented levels, too. The new handset’s ‘Always On’ capability lets users alternate between calls effortlessly, ensuring they are always reachable on both the satellite and the terrestrial networks. Callers can be contacted on their GSM number even while on an active satellite call – and vice versa. Thuraya’s superior network enables clear communications and uninterrupted coverage across two thirds of the globe by satellite and across the whole planet through its unique GSM roaming capabilities, with 389 agreements already in place. The Thuraya XT-PRO DUAL is designed for users who frequently move in and out of terrestrial coverage, like government missions, and oil and gas refinery and exploration companies, both on and offshore. The world’s most advanced satellite phone will also appeal to NGOs, SMEs and large scale enterprise companies, as well as VIPs and consumers alike. Thuraya’s comprehensive satellite network provides reliable, clear and uninterrupted communications in more than 160 countries across Europe, Africa, Asia and Australia; and in GSM-mode the Thuraya XT-PRO DUAL supports most 2G/3G frequencies across the world. The emphasis on flexibility continues with the Thuraya XT-PRO DUAL’s advanced navigation capabilities through GPS, BeiDou, Glonass and Galileo. Users of the Thuraya XT-PRO DUAL can also share current coordinates, enter waypoints to navigate to specific positions using the electronic compass, and use position logging. In another industry first, the handset’s advanced tracking capabilities offer three different options, based on preset time intervals, distance travelled, and detection of movement outside a preset geofence. The geofencing process is simplicity itself, using any three to seven coordinates of the user’s choice. For full and secure control, all tracking functions are user-activated, and cannot be initiated or controlled by unwelcome external entities. The Thuraya XT-PRO DUAL’s battery delivers up to 11 hours of talk and 100 hours of standby time. Performance and reliability are further enhanced by the SOS emergency button. The handset also benefits from a highly ruggedized shockproof, water and dust resistant body, and glare resistant Gorilla glass display.